Mark and I had a date at the library last Friday. There is the sweetest little library only about a mile from us (if you knew me, you’d know how often I use the phrase “only about a mile from us”; it could be a drinking game, seriously) and I know that we are terribly fortunate to be able to walk to it. We had a delightful time and Mark was a real peach. He even let me pick out some books for myself after I tore him away from the mega-blocks and board books in the children’s section. Can you tell where my head’s been lately? That first book, Being Perfect, is more of an essay with photographs. I really enjoy Anna Quindlen’s writing (I think this is the third book of hers I’ve read) and this is short and satisfying. I read it over lunch. The American Barn? Well, I wanted to look through all the photos for inspiration. 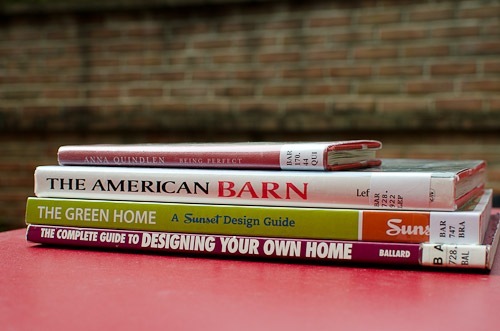 This is the one book I haven’t delved into yet, but that’s because I’ve been reading through The Green Home and the Designing Your Own Home books. You may wonder why I, as an architect, would need a book like this. Well, Dr. Jay and I will definitely build our own home at some point, and since we are making the move down south, that could potentially happen in the next few years. We realized in talking about this a few weeks ago that despite having savings for a house, we aren’t really sure how the financing of a residential construction project works. This book dedicates a few chapters to this subject, and though it’s from 1995, it’s helpful for me to read about the process and remind myself of all the preliminary work and decisions involved. Knowing what to expect in advance could save us a lot of energy, and money! This book is also written by a University of Texas at Austin graduate, which I didn’t realize until I got it home. I think it must have been calling to me from the library shelves. I grabbed The Green Home because I’d like to start researching materials (and pricing) for this pie in the sky home we might one day build. Cork floors seem like the have lots of benefits (easy on the legs, a rapidly renewable material, relatively inexpensive, good for the wear and tear of a dog and children) but I’m wondering how they perform if they’ve been painted? I was thinking that a classic black and white checkerboard pattern could be great for a kitchen, but would that work on cork? Please let me know if you’ve had experience with this. If I make more headway in the category of Our Future Home, I’ll certainly let you know. Right now I divide my thinking/internet research time between that, pinning images on PInterest, and looking for places to move in Tennessee. That’s what’s been going on here, lately. We’re glad it’s March and hoping the winter weather and sickies are behind us! That’s right. The good people of National Geographic actually got a house to float with balloons, just like from the movie UP. Well, a small (16’x16’) house carried by 300 (three houndred!) LARGE eight foot tall balloons. So incredible. Apparently the house flew to an altitude of 10,000 feet and stayed in the air for about an hour. And, as one commenter on the National Geo blog asked, How’d that thing land? I guess we’ll have to watch the episode of “How Hard Can it Be” which will air on the National Geographic Channel later this year. Or you guys can watch it and let me know, since we’ve had a little snafu with our tv-watching recently. Let’s just say you’ll see me writing about HGTV a lot less. with great interest. You may remember it from my holiday gift guide post. Dr. Jay took the hint and gifted me the two books for my birthday. A review to come! We love it in Mark’s room, though it’s only temporarily in a frame I had on hand. I’m thinking it needs a thin black frame with a little sliver of blue mat. I’ve put together this list of must-haves for the designer-type in your life (or maybe that’s YOU!). Happy Last-Minute Shopping. There’s no time like the present to shop for presents, as I always say. I’ve been eyeing this book since I spotted it in my boss’s office last year. As an architect, I’m always being asked "What style is that?" Of course, so much of what’s built today is a big mish-mash of styles, no style at all, or something so out-there and modern that it doesn’t have a style, but a reference book like this would give me a place to start to answer those burning questions. And who doesn’t love a good reference book? This book looks beautifully put together, and if you’re wondering about style, I’d say it’s about the “New Traditional”. Linnea 2011 Collectable Poster Calendar– these are beautiful every year, and somewhat hard to find. Usually Paper Source has them! 2011 Datebook from POST Impressions– I bought this for my self last year and LOVE it. It was a leap of faith on my part, because I’m not typically a weekly calendar type of gal (I like the month overview) but I was desperate to get organized and this gorgeous little book helped me do so stylishly. Last year I got it in the gold. Tiffany blue for 2011, please Santa? MoMA Modern Playhouse– I saw this last week while walking through the children’s department at Nordstrom’s. Sure, it’d be great for kids, but I know a lot of adults (ahem, ME) who would love to play with this. Put together the interchangeable walls and furniture and you have hours of fun. Tired of relying on your iPhone for vintage-looking photos? Want to step back in time and create lo-fi images with a tried and true film camera? Urban Outfitters offers a whole slew of cool cameras like the Lomography Diana + Parisian shown above, exclusive to UO. Don’t want to wait for that film to be developed? Try the FujiFilm Mini Instax Instant camera. This little number will give you cute, credit card sized images in an instant, and no shakin’ that Polaroid picture. Any photo or film buff would love these or the other cameras Urban Outfitters has to offer. And lastly, if you want to be a really generous gift-giver to your designer-type friend, consider the Modern Shed. This company, a husband and wife team out of Seattle, can provide the ultimate backyard getaway, workshop, or studio (yoga, anyone?) for your lucky designer friend. I don’t think you can go wrong with this one. Who would not want their own little shed for doing what they want, when they want? That’s it for me this holiday season. Please stay tuned in 2011. I’m looking forward to a stronger year of babbling, what with our almost 5-month old teaching me all about it daily. I have hopes and dreams for the blog in the New Year- thanks for sticking with me. P.S. I was not paid or perked by any of the aforementioned companies. These are all just products I’m interested in telling my readers about, plain and simple.